What is a cold water lobster? A “true lobster,” the cold water lobster lives in the cold waters of North America, Europe, or the southern hemisphere, and are distinguished mainly by their two large claws. Maine lobster, sometimes called Boston lobster, is a cold water lobster (officially known as Homarus americanus, or “American lobster,” from the genus homarus, of the family nephropidae). The cold water Maine lobster is a very different creature from a warm water lobster, which has no claws, and are sometimes called spiny lobsters, rock lobsters, Caribbean lobsters, or slipper lobsters. 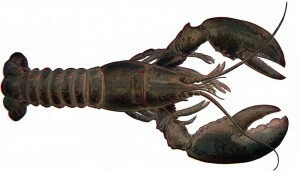 Cold water lobsters usually have whiter, sweeter, and more tender meat than warm water lobsters. And of course, cold water lobsters have meat in their claws as well as their tails, while the only edible meat on a warm water lobster is founds in its tail. Why in many restaurants are MAINE LOBSTERS more expensive then COLD WATER LOBSTERS? I was told by a seafood purveyor that the only true “cold water ” lobsters come from South Africa and New Zealand. Is this correct ?